Can't find the perfect GIF online? Make it yourself! Giphy started out as a platform for finding the perfect GIF to share with friends. Now Giphy is out to make your everyday a GIF-able moment. 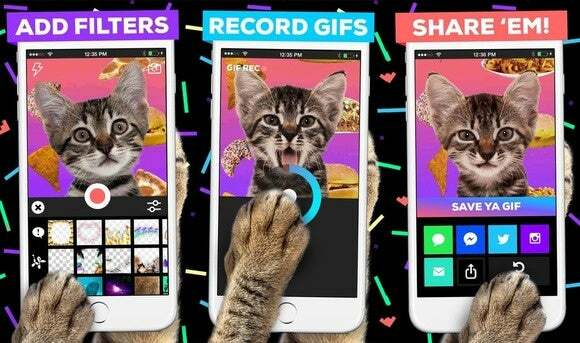 On Wednesday, Giphy released a brand-new iOS app, Giphy Cam, for creating GIFs. The free Giphy Cam app uses your iPhone’s front-facing or rear camera to record 5-second clips that are automatically looped. You can send these GIFs via iMessage, share them on social media like Twitter or Instagram, save to the Camera Roll, or AirDrop them from your phone to your desktop and embed them in a blog post. Giphy Cam lets you have fun with the creation process too. You can layer in filters, stickers, and other trippy effects to make the GIFs extra wacky. Although Giphy Cam’s creation tools resemble Instagram’s photo-editing and filter options, there is no social feed, user profiles, or follow buttons. Apparently this was a deliberate move on Giphy’s behalf. The company wanted to make the app a creation tool, not a social network, according to Logan. This sets it apart from Path’s new Kong app, and Phhhoto, which also rely on your phone’s camera to stitch together burst images into GIFs that you can filter and share with friends. On Kong and Phhhoto, you can like other users’ selfie GIFs and add users to your home screen on the app to always see what GIF they just created. Wacky creation tools that export seamlessly to messaging apps and social networks have been quite the rage lately. We now have silly avatar makers, Bitmoji and MyIdol, as well as Dubsmash where users can lip sync to their favorite songs or reenact their favorite TV lines and share with friends. Now, the Giphy Cam app adds GIFs to the ways you can express yourself online and show your personality. Why this matters: Even though sharing GIFs has become extremely popular pastime on the Internet (Facebook finally supports them), it’s actually rather complicated to create a GIF from scratch. There have been a few services like the GifMill app and YouTube’s built-in GIF maker that have made the process a lot easier, but none are as simple as the Giphy Cam. So expect more homemade GIFs to pop up in your messages and social media feeds in the near future.